Following the UN’s “biased” stance on Israel, Nikki Haley, the U.S. ambassador to the UN, who holds cabinet rank in President Donald Trump's administration, signaled Tuesday the U.S. might withdraw from the United Nations Human Rights Council (UNHRC) unless reforms are ushered in including the removal of what it sees as an "anti-Israel bias." 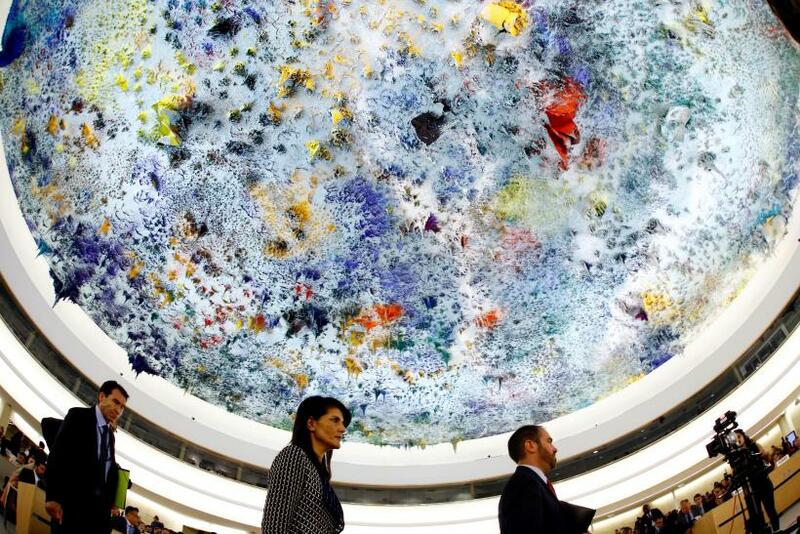 Haley addressed UNHRC’s 35th session in Geneva on Tuesday, where she called for reforms. “It is essential that this council address is chronic anti-Israel bias if it is to have any credibility,” she said. Last week in an op-ed for the Washington Post, Haley criticized countries such as Venezuela and Cuba, both council members, for their human rights abuses. She said the council needed to "end its practice of wrongly singling out Israel for criticism." While she highlighted work done by the UNHRC, she said not enough had been done to criticize Iran, a "country with an abysmal human rights record" and Venezuela, which is in political turmoil where dozens of protesters have been killed in recent months. United Nations High Commissioner for Human Rights Zeid Ra'ad al-Hussein said the Palestinian people were marking "a half-century of deep suffering under an occupation imposed by military force." He also said Israelis needed freedom from violence and the need to "maintain the occupation and for both peoples there will only be a prolongation of immense pain." After addressing the opening day of the body’s 35th session, Haley will host a panel on “Human Rights and Democracy in Venezuela” and address the Graduate Institute in Geneva before heading to Israel. However, following the warning, the council expressed concerns and fears over the U.S. withdrawing support leading to other nations steering the conversation, agenda and priorities of the organization. Even as the U.S. threatens to leave the council, it is considered unlikely it would leave during this session, which ends on June 23. On June 19, the UNHRC will hold a debate on alleged Israeli human rights abuses against Palestinians. The UNHRC is mandated to discuss the Israeli-Palestinian conflict at every session under its rules. There is no similar mandate against any other country. The Israeli-Palestinian conflict will also be raised on June 12 by Dubravka Šimonović, a special reporter on violence against women, who visited Israel and the Palestinian territories in September 2016. Šimonović will present separate reports on the status of Israeli and Palestinian women.